The Crown At Turners Hill is proud of it's extensive menu of traditional English dishes, with the emphasis on home cooked fresh local produce. Complimented by a select range of wines and an ever changing choice of local and regional ales; which is reinforced by our three Beer festivals: Spring, Summer and Autumn (The Big One!). All the meals are freshly prepared to order by the quality chefs. 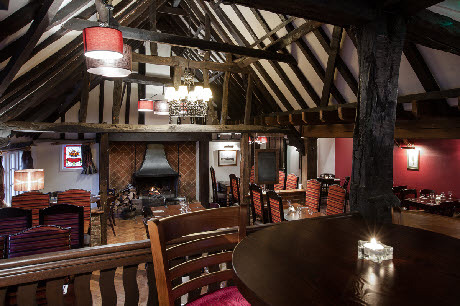 The Restaurant is sited within what was originally a 17th Century barn ~ still retaining its Jacobean oak beams ~ and the cosy warm atmosphere is enhanced during the cooler months by the open log fire. The Restaurant normally has a mix of seating for 2 to 8, for larger groups please pre-book and we will endeavour to meet your needs.